Ashanti on her promotional tour for her new album called "Braveheart" stopped by Power 99 in PA. She looks great, now lets hope her album is good. 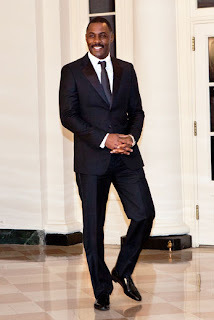 A fine specimen, Idris Elba was at the White House for an event, I must say that suit is well tailored. Beautiful. Wyclef was spotted in Times Square about to hop into his ride, we haven't heard much from him lately, wonder whats he been up to. Tyra Banks is looking really curvaceous on the red carpet of a Benefit event in NYC, I see she is back to her weave/wigs since breaking up with her financier boyfriend late last year. June Ambrose I must say I luv her, I can't wait to see her new show, "Styled by June" which airs next Monday on VH1. Here she is at her premiere.